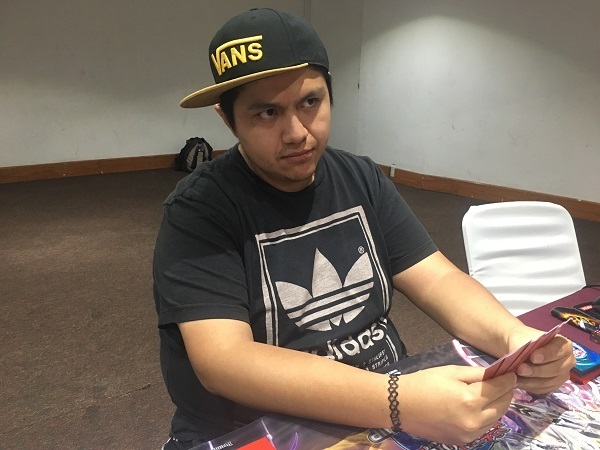 Alejandro Vivaldo Reyes Suarez from Mexico City competed in the Yu-Gi-Oh! 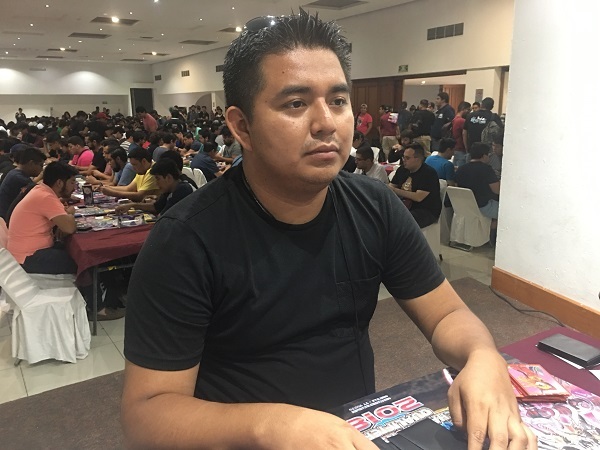 World Championship back in 2008 by winning Mexico’s National Championship, and he’s a 2-time YCS Champion from winning YCS Mexico City in 2011 and YCS Sao Paulo in 2015. Now he’s Dueling in our Round 2 Feature Match, looking for a win that’ll take him closer to competing in the 2018 World Championship! He’s facing off against Francisco de Jesus Zavaleta Diaz from Santa Cruz, Oaxaca Mexico! This is Francisco Zavaleta’s first WCQ event, and he’s looking to score a big upset by defeating Alejandro Reyes here and now! Reyes is using a True Draco Deck featuring Sky Strikers. Zavaleta is playing Trickstars. It’s time to Duel! Zavaleta won the dice roll and chose to go first. He Summoned Trickstar Candina and activated its effect to add Trickstar Light Stage to his Deck and then activated Light Stage to add Trickstar Lycoris to his hand. He used the effects of the 2 Lycoris in his hand to Special Summon both of them in Defense Position by returning Candina to his hand and then passed his turn. Reyes opened up with Dragonic Diagram, True King’s Return, Called by the Grave, True Draco Apocalypse, and Sky Striker Mecha – Hornet Drones. He drew a card, losing 800 Life Points to the effects of each Lycoris and Light Stage. He activated Diagram next and Set his Apocalypse. He activated the effect of Diagram, and when Zavaleta tried to negate it by discarding Ash Blossom & Joyous Spring, Reyes Chained Called by the Grave from his hand to banish the Ash Blossom and resolve his Diagram’s effect. He destroyed his own Called by the Grave with Diagram and added Dinomight Knight, the True Dracofighter to his hand. He activated Hornet Drones next, and used the Sky Striker Ace Token to Link Summon Sky Striker Ace – Kagari. He used Kagari’s effect to add Hornet Drones back to his hand. He then Tribute Summoned a Dinomight Knight, the True Dracofighter by Tributing Apocalypse, destroying a Lycoris with Apocalypse’s effect. 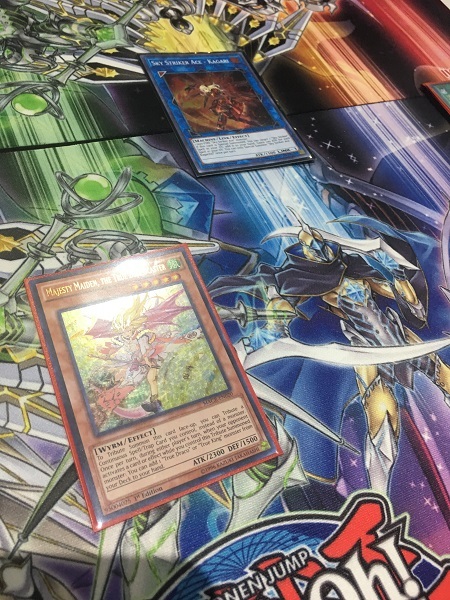 Zavaleta discarded Ghost Reaper & Winter Cherries from his hand to banish all copies of Sky Striker Ace – Shizuku from the Extra Decks, and Reyes Chained the effect of his Dinomight Knight to activate an Apocalypse from his Deck face-up. He attacked with his monsters before passing. Zavaleta used Light Stage to try to pin down Reyes’s face-down True King’s Return. Reyes Chained it, along with Dinomight Knight’s effect, adding another Apocalypse to his field. He used Raigeki to clear the field next, and then Summoned Candina and activated its effect. Candina attacked directly, and then Reyes used his True King’s Return to Special Summon Dinomight Knight from the Graveyard. In the Damage Step, Reyes activated the effect of a True Draco Apocalypse, sending his on-field Apocalypse to the Graveyard to halve the ATK of Candina and destroy Lilybell with Apocalypse’s in-Graveyard effect. Zavaleta Set a card to his back row before passing. Reyes activated the effect of Diagram to destroy a Hornet Drones from his hand and add Ignis Heat, the True Dracowarrior to his hand. He Tributed True King’s Return to Summon it, using the effect of Return to destroy Candina. Both of Reyes’s True Dracos attacked directly, knocking Zavaleta out of the Duel! Alejandro Vivaldo Reyes Suarez takes the first Duel with his True Dracos! Zavaleta Set a card to each zone and passed. 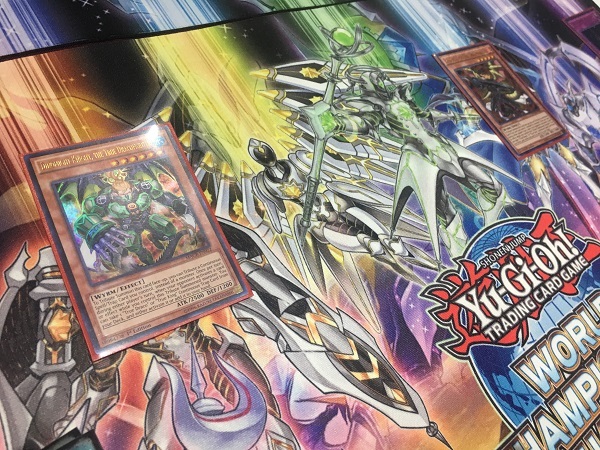 Reyes opened up with 2 copies of Sky Striker Mecha – Hornet Drones, True King’s Return, True Draco Heritage, Majesty Maiden, the True Dracocaster, and Dinomight Knight, the True Dracofighter. He activated a Hornet Drones to Special Summon a Sky Striker Ace Token and then Link Summoned Sky Striker Ace – Kagari. He used Kagari’s effect to return the Hornet Drones to his hand and then activated it to Special Summon another Token. He then Tributed the Token to Summon Dinomight Knight, and then attacked Zavaleta’s face-down Ash Blossom & Joyous Spring with Kagari. Reyes lost 300 Life Points, and then Dinomight Knight attacked and destroyed the Ash Blossom. Reyes activated True Draco Heritage next, and Zavaleta Chained Cosmic Cyclone to banish it. Reyes Chained Dinomight Knight’s effect to add a True Draco Apocalypse to his hand before the Heritage was banished. He Set 2 cards to his back row and then used Kagari to Link Summon Sky Striker Ace – Shizuku. He added Sky Striker Mobilize – Engage! to his hand in the End Phase with the effect of Shizuku. Zavaleta entered his Battle Phase and then activated Evenly Matched from his hand at the end of it. Reyes Chained the effect of his Dinomight Knight, adding Apocalypse to his hand, and then banished all cards from his field face-down except for his face-down True Draco’s Return. Zavaleta Set 2 cards to his back row before passing. Reyes activated Draconic Diagram and then used Sky Striker Mobilize – Engage! to add Sky Striker Maneuver – Jamming Waves! to his hand. He activated Jamming Waves to target a Twin Twisters for destruction, but Zavaleta Chained it to destroy the face-down True King’s Return and the Dragonic Diagram. Reyes activated Hornet Drones next and used the Token to Link Summon Kagari. He added Engage from his Graveyard to his hand and then used Engage to add Sky Striker Mecha – Widow Anchor to his hand and draw a card. Kagari attacked directly. Reyes Set 2 cards to his back row before passing. Zavaleta Set a card to his back row and then passed. Reyes attacked directly with Kagari and passed. Zavaleta drew a card and passed. Reyes Tributed a True Draco Apocalypse to Summon Majesty Maiden and used the Apocalypse’s effect to destroy Zavaleta’s face-down monster. Direct attacks from Kagari and Majesty Maiden finished Zavaleta off! Alejandro Vivaldo Reyes Suarez takes a 2-0 victory in Round 2 with his True Draco Sky Striker Deck!